Eclectic Foundations has a language arts curriculum that gives you everything you need to teach your child phonics, grammar, spelling, reading comprehension, handwriting, composition, and poetry. There are three levels to choose from and my daughter and I have been using the Eclectic Foundations Language Arts Level B. They have page on their website that helps you decide which level to get for your child. Based on what it said there, I thought level B would be the best option for my youngest. The program is intended to be used 4 days per week over a 36 week time span. This kind of layout works perfectly if you go to a co-op or homeschool enrichment of some type during the week. We go to an enrichment and tutorial program on Mondays through the school year, so any curriculum that is 4 days per week or less works best for our family. What’s included in this language arts curriculum? The Teacher’s Guide has detailed instructions on what to do with your child each day. The author of the curriculum is Elizabeth Ratliff and on the first page of the Teacher’s Guide she explains what books and supplies you will need, as well as a little bit of background of the curriculum. The Teacher’s Guide is extremely easy to follow. It some cases it even tells you exactly what to say. The Student Workbook has one or more pages per lesson. At the beginning, it just has a word list for the child to read, then has lines for copy work or dictation. The poetry you and your child will read and study is also in the student workbook. The Phonics Practice Sheets are all laminated so they can be used over and over again. You just use dry erase pens with them to practice the child’s phonics skills. The Word Cards come as a set of 8 1/2 x 11 card stock paper and you cut out the cards as they are needed in the lessons. The words on the cards are a form of bubble letters so they can be colored. In a lesson, the teacher’s guide will tell you which cards you need and what color the child will need to color them. They are colored a certain color depending on whether it is a noun, article, verb, etc. And finally, the McGuffey’s First Eclectic Reader is why some people might call this an old fashioned curriculum. The stories in the reader start out as simple as “The dog. The dog ran.” and increase in difficulty and length to stories that are multiple pages long. Olivia and I have been using this curriculum for a few weeks now and have enjoyed it. I like that it incorporates grammar into the curriculum along side learning how to read. I also like that it includes examining poetry. We will continue to use this curriculum until it is finished. Follow Eclectic Foundations on Facebook for more information! What is it? 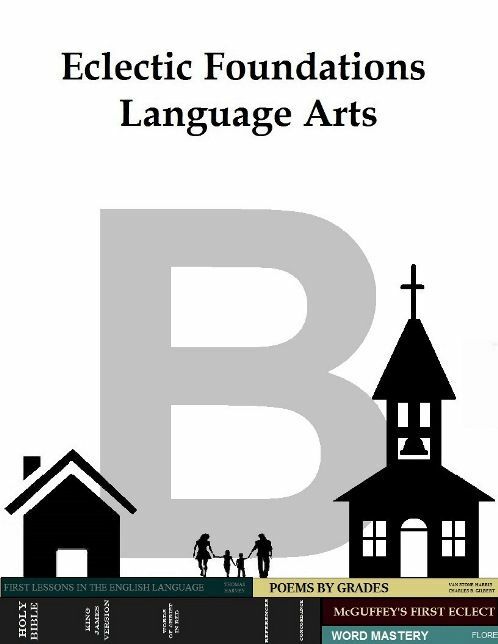 Eclectic Foundations Language Arts program – Includes for Phonics, Grammar, Spelling, Reading Comprehension, Handwriting, Composition, and Poetry. For whom? Children ready to learn to read or whom have just started reading. How much is it? The Teacher’s Guide is $12, Student Workbook is $24, Phonics Practice Sheets and Words Cards are $20. Alternatively, you may purchase all of it as a PDF download for $30. Also, the McGuffey reader can be downloaded for free or you may purchase a physical copy for $6.99 for soft cover and $11.83 for hard cover.